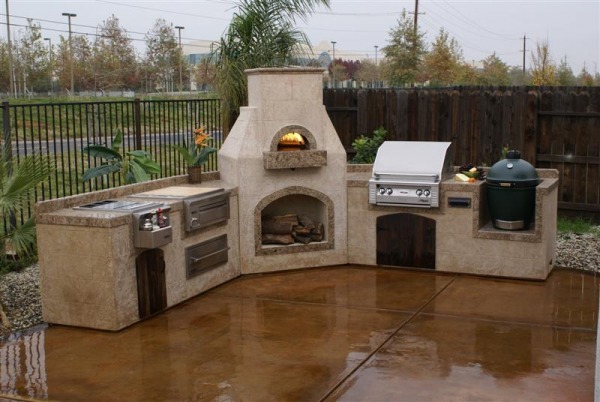 This pizza oven with BBQ Kitchen brings entertaing to a whole new level. 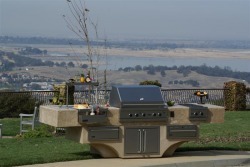 Pick from our Jenn-Air, Alfresco grills, OCI and Viking outdoor products. 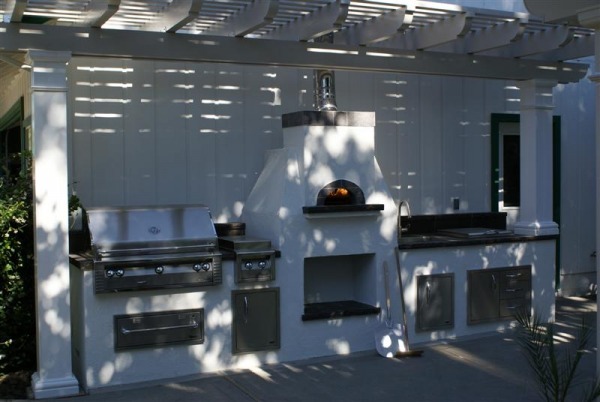 This picture shows an Alfresco LX2 42" grill with Sear Zone, Alfresco Warmer Drawer, Alfresco Double Side Burner, A outdoor gas pizza oven, Sink, OCI Single door and combo unit and OCI Cooler. This 12 foot custom BBQ Island includes a Viking 41 inch grill, Viking Bar Sink, Viking Double Side Burner, Viking Storage Drawe, Viking Warmer, and Viking Double Door. This 11 foot custom BBQ Island includes a OCI 36 inch grill with Sear zone, OCI bar Sink, OCI Combo drawer/door unit and refrigerator. 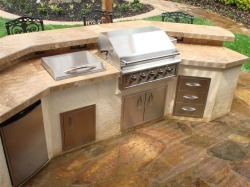 This BBQ Island also, includes a 6 inch raised bar with two Outlets and 2 Lights on backsplash. Also, includes additional lights under the bar and a kick plate to rest your feet on. 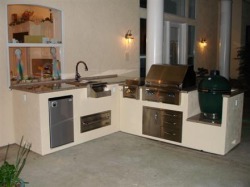 This L-shape custom BBQ Island includes a 30 inch Alfresco LX2 grill, Alfresco warmer drawer, Alfresco Sear zone built in seperate componet, Big Green Egg Smoker, OCI Combo door and drawer unit, OCI Bar sink, and Refrigerator.